Grammy Award-Winner Furtado Announces Availability of Limited-Edition Campaign Books in Walmart Stores Nationwide and Helps Put Early Literacy in the National Spotlight. Yesterday, September 14, some lucky preschool children in Manhattan got the chance to meet Grammy Award-winning singer-songwriter Nelly Furtado, as she announced that she joined Jumpstart's Read for the Record, to be held Oct. 8th. Presented in Partnership with Pearson, Jumpstart's Read for the Record is a celebration of reading and community service to raise awareness about the importance of early literacy. Furtado, along with representatives from Jumpstart, Pearson, Walmart and Redbook, gathered at the Borough of Manhattan Community College (BMCC) Daycare Center to announce that a limited edition of Eric Carle's The Very Hungry Caterpillar, Read for the Record's official campaign book, is now on sale at Walmart stores nationwide. Net proceeds from the sale of the book will benefit Jumpstart*. The book is also available to donate or purchase online at http://www.readfortherecord.org. The event featured a press briefing and a special reading by Furtado of The Very Hungry Caterpillar, and book-related activities to bring this iconic classic to life for the participating children. BMCC, a member of the City Universities of New York system, has been a higher-education partner of Jumpstart for over a decade, and is one of the foundational members of Jumpstart's strong New York City presence. Furtado, whose new single, "Manos al Aire" recently hit number one on the Billboard Latin Top 100, said "As someone who started writing songs at a very young age, I know how important literacy is. I was shocked to learn that half of all children in low-income communities enter school without the language and literacy skills they need to succeed. That's why I'm supporting Jumpstart's Read for the Record to do my part to help secure a brighter future for today's at-risk preschool children." This year, on October 8, Jumpstart's Read for the Record has set out to break the world record as adults read the same book on the same day to more than one million children across the country. The campaign raises funding to support Jumpstart's yearlong work with preschool children in low-income communities where Jumpstart is working toward the day all children enter school prepared to succeed. The commemorative edition of The Very Hungry Caterpillar includes a foreword with messages of support from Matt Lauer and Meredith Vieira of NBC's TODAY Show, Tony-, Emmy- and Golden Globe-winning actress Mary Louise Parker, and entertainer, actor, author, recording artist, two-time Grammy Award winner, and NAACP Image Award winner, LL Cool J. "The books we read as children provide us with treasured childhood memories," said Jumpstart's President James Cleveland. "Unfortunately, most children in low-income communities have few, if any, age-appropriate books in their homes. As a result, they miss out on the reading experiences that form the foundation for success in school and life. Jumpstart's Read for the Record raises awareness about the importance of early literacy and -in addition to the books sold at Walmart- donates more than 250,000 campaign books to children in need." "Focusing everyone's attention on one book for a single day highlights the importance of reading as the foundation of all learning," said Pearson Foundation President Mark Nieker. "The Read for the Record Campaign shines the spotlight on the critical role Jumpstart plays in supporting literacy at a crucial point in a young child's life. By supporting programs like Read for the Record and organizations like Jumpstart, Pearson is working to close the gap in school readiness and to improve American education." "Access to books, especially quality literature is one of the major factors of early educational success for children and Walmart is committed to doing our part to raise awareness and provide access," said Walmart Foundation president Margaret McKenna. "From our associates who are reading in Walmart stores on October 8th, to customers who support Jumpstart by buying The Very Hungry Caterpillar at Walmart, we're helping to instill a love for reading in children, planting seeds for later success." "BMCC is a staunch supporter of early literacy and the work that Jumpstart does to celebrate literacy as a cornerstone of education and upward mobility," said BMCC President Antonio Pérez. REDBOOK, a national magazine that speaks to more than 10 million women each month, is supporting Jumpstart's Read for the Record. In addition to Editor-in-Chief Stacy Morrison's presence at the September 14 book launch event, the magazine will run a feature story on the importance of early literacy in the October 2009 issue and mark October 8, 2009 as a day of service for REDBOOK staffers, encouraging them to get involved in the campaign. "REDBOOK's mission is to speak to all sides of the modern woman, including her sense of community and philanthropy," said Morrison. "Through this campaign we can empower women across the country to engage in a fun day of service with their children while giving back to those less fortunate. That's why I'm here today and why I'm challenging my staff to really get involved in this campaign." Over the past three years, Jumpstart's Read for the Record has raised more than $3 million to support Jumpstart's mission of ensuring that every child enters school prepared to succeed, and prior to this year's Campaign more than 500,000 books have been donated to children in need. Pearson, Penguin and Walmart are joined in supporting this campaign by Jumpstart's national corporate partners American Eagle and Sodexo. Visit http://www.readfortherecord.org to pledge to read and learn more about Jumpstart's Read for the Record. Visit http://www.pearsonfoundation.org for more information about Pearson's support of this campaign. 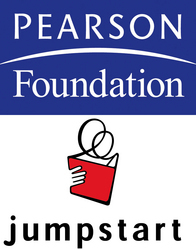 Pearson, the international education and information company, is Jumpstart's Read for the Record Sponsor and Founding Partner. The Pearson Foundation extends Pearson's commitment to education by partnering with leading nonprofit, civic, and business organizations to provide financial, organizational, and publishing assistance across the globe. The Foundation aims to make a difference by sponsoring innovative educational programs and extending its educational expertise to help in classrooms and in local communities. For more information, visit http://www.pearsonfoundation.org. REDBOOK magazine (http://www.redbookmag.com) is the total-life guide for every woman who is blazing her own path through adulthood and taking on new roles--wife, mom, homeowner--without letting go of the unique woman she's worked so hard to become. Readers can also interact with the brand on the digital front, with REDBOOK mobile (m.redbook.com). REDBOOK reaches over ten million women each month (MRI, Spring 2008) and is published by Hearst Magazines, a unit of Hearst Corporation (http://www.hearst.com) and one of the world's largest publishers of monthly magazines, with nearly 200 editions around the world, including 15 U.S. titles and 20 magazines in the United Kingdom, published through its wholly owned subsidiary, The National Magazine Company Limited. Hearst reaches more adults than any other publisher of monthly magazines (73.4 million total adults, according to MRI, Spring 2009). Borough of Manhattan Community College (BMCC) is the largest community college in the City University of New York, and the only community college in Manhattan. It has an enrollment of 21,858 students (59.4 percent women, 40.6 percent men). BMCC is also an international college with students from over 150 countries. According to data from the U.S. Department of Education and the Institute of International Education, nationwide BMCC ranks: second in awarding associate degrees in business, management, and marketing; third in awarding associate degrees in computer and information technologies; fifth in awarding associate degrees in education; ninth among community colleges in enrollment of international students; and twelfth in conferring associate degrees in all disciplines. *] A minimum of $1.00 (12.5% of the retail price) for each book purchased.